Terrassa City of Film invites the entire community, especially the educational one, to the International Poster Competition of the Busan International & Kid Youth Festival. Busan International Kids & Youth Film Festival (BYKY) as the only international kids film festival in Korea, it provides a ground for visual arts education. The festival hosts events such as Film Workshop and Seminars for children, Film and Fun, Poster Contest & Exhibition and Kids’ Cine-Playground, attracting huge attention of filmmakers from all over the world while achieving recognition as a Kids & Youth centered film festival. You can find more information about BIKY here. Each year, BIKY makes his official poster collecting drawings of children that bring their creativity, freshness and fantasy. After the selection of drawings and the work of different artists, they are grouped into a poster in the form of “collage”. What do we have to do to participate? Attach the application form to the back of the poster. Each member city of the UNESCO network (such as Terrassa) that participates will select a drawing through its own entrance process, and then send the selected drawing to BIKY. 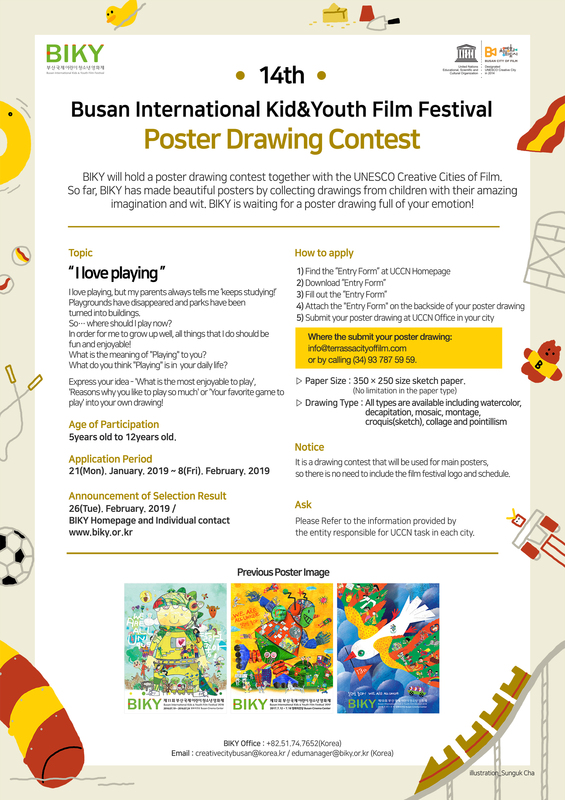 All drawings sent from UNESCO film cities will be included in the official poster of the 2019 edition of BIKY and will be shown during the BIKY period. BIKY will select a winner of the 12 cities to give a special opportunity: invite the winner to BIKY to participate in events of the festival in Korea. If you are between 10 and 12 years old, BIKY will select you as a member of the jury. Download the Registration Form and start creating your posters! Go on! NOTE: FOR ANY DOUBT, YOU CAN CONTACT BY MAIL TO: info@terrassacitytoffilm.com or by calling 93 787 59 59.